Born in Lincoln in 1962 Jacqueline Williams soon became interested in art at school and went on to attend the Gloucestershire College of Arts and Technology. Her success at College earnt her a place at the prestigious Royal Academy School London. Jacqueline's continued hard work and success meant that she was elected a member of the New English Art Club ( NEAC) in 1993. She has won many awards including: The Antique Collectors prize, Antonio De Segonzac Travel Scholarship, Elizabeth Greenshields Award, Patterson Prize NEAC, Critics Prize NEAC, Patterson Memorial Prize. 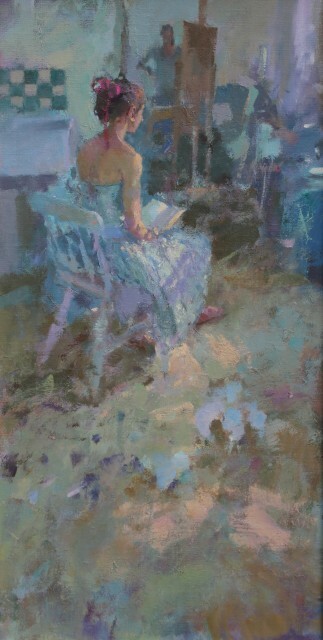 The artist Ken Howard enthusiastically writes "I first met Jackie Williams when she was a student at the Royal Academy Schools in the mid eighties. Already I could see she was following her own particular vision which had nothing to do with being consciously innovative or modern. Jackie's work is a celebration of nature, of beauty, and of light, and being celebratory she touches cords in her followers and reveals to them a world, her world, to which they can respond." Jackie's work is in the main-stream tradition of British painting in the twentieth century, from the Camden Town and Euston Road Schools through New English painters like Sickert and Steer; a worthy follower of that greatest of English women painters, Gwen John. Her art is based on a personal vision expressed through sound craft, fine drawing, a wonderful sense of tonal pitch and a highly developed sense of colour.